"Ground-truthing" allows us to eliminate any distortions and develop underground pipeline locations accurate to within 10 centimeters (4 inches). As we continue to wait for the Federal Aviation Administration (FAA) to create regulations that will allow the use of drones or unmanned aerial systems (UASs) for commercial applications, the government is already using and testing UAS’s through their UAS program as part of the U.S. Geological Survey (USGS) under the Department of the Interior. USGS predicts that sensors on the UAS’s will greatly improve the inspection of complex infrastructure (including underground infrastructure) with regular aerial monitoring with a collection of various sensors. However, initial tests showed that the currently used aerial sensors must be adapted to handle the interference from the drone engines that is occurring since the sensors are much closer to the engine than in manned, fixed-wing aircraft. Meanwhile, in many underground infrastructure mapping cases of various areas around the U.S., only 2-dimensional images and data are available. This data is being used despite its limitations in establishing only the x and y positioning of the infrastructure. Two dimensional images are problematic because they fail to provide a critical depth of the utilities in question. Currently at Geospatial, we solve this problem by utilizing the latest technologies to accurately determine a depth or “z” coordinate with the methodology known as “ground-truthing” which enables us to eliminate any distortions and develop x,y&z underground pipeline locations accurate to within 10 centimeters (4 inches) of the pipeline centerline. 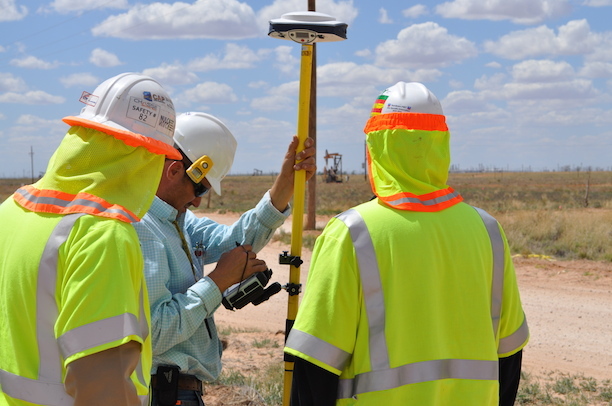 In addition, we have the ability to utilize aerial technologies to locate and geo-reference pipeline leaks (gas, oil & water) resulting in true x,y,z, coordinates of the leak location and a determination of the relative size of the leak. It will be interesting in the coming years to see if the USGS’s prediction that by 2020, UAS will become the primary platform for DOI aerial remote sensing applications, and if the sensors will be modified to handle the interference from the engines of the UAS, as well as, incorporating additional sensing technologies.